When you have service and repairs performed at Redmon's Automotive Service, a TECHNET Professional Automotive Service® center, you're covered by a Nationwide Warranty. The Nationwide Warranty ensures worry-free driving, and extends across North America, providing vehicle protection on qualifying service and repairs. 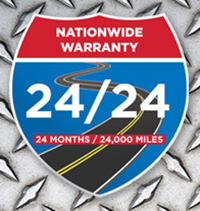 The Nationwide Warranty program covers you for qualifying services and repairs for 24 months or 24,000 miles, whichever comes first when traveling more than 25 miles from Redmon's Automotive Service in Swannanoa, North Carolina. When you spend $25 or more at Redmon's Automotive Service, you have roadside assistance reimbursement coverage for a full year. So when you need a tow, lock-out aid, battery jump start, emergency fuel delivery, or flat tire changing assistance, help is on the way.